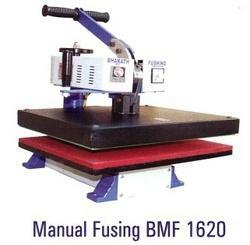 All Types of Quality Fusing Machines. Ideal for fusing, Shirts, Collars, cuffs, front placket, Trousers, Waist bands, pocket flaps etc. Coats/suits, Coat inner front, pocket flaps and all parts. Shoe/leather, Shoe upper and all types of leather articles, Knitwear, Collars front placket and many other parts. Embroidery applique lining etc. 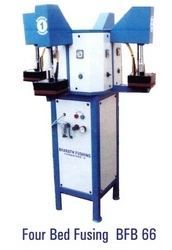 Production is greatly increased as this is a conveyer type fusing machine. 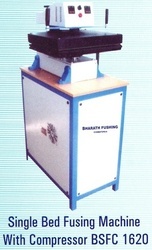 Curing / fusing of all kinds of inks like direct inkjet printed fabrics and screen printed inks like pigment, khaki etc. Foil printing on cut parts and roll to roll fabrics. Actual value precise digital temperature control gives best adaptability to fuse any type of interlining to any kinds of fabrics. Using the SSR electronic switching the temperature difference is kept below +/- 3*C.
Easy to replace belt reduces maintenance down time. Ultimate tracking through unique belt tracking device. Low maintenance with few rollers compared to any machine available in the world. Large diameter of rollers for easy joint rollover and prevents premature joint breakage. Soft spring mounted tail roller for minimum belt tension. All world standard parts there by economy in maintenance. 6 kgs pnematic pressure for out of the world fusing. Interlocking endless belts for high life of the belt with no crease marks on fused articles. 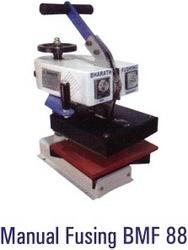 Rotary scrapper for easy strip off of adhered fusing materials. 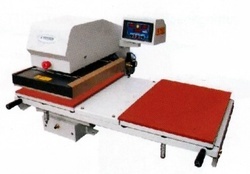 Machine Dim - L150" W60" H45"
Machine Dim - L150" W80" H45"
Fast heat up and cool down time enhances belt operation life. 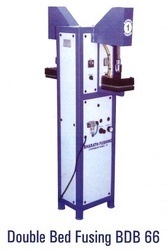 Manual pressure system delivers up to 3 Kgs pressure. High quality endless belts for high life of the belt with no crease marks of fused articles. All geared drive there by no chain loosening and misalignment. Machine Dim - L 31" W 78" H 50"
Macro infra red curing technology consumes extremely less electricity, installed with the best infra red tubes with perfect conrol on temperature and evenness of heat. 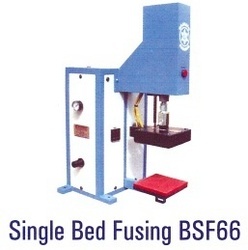 Curing machine with leading edge technology for curing requirements of water base, plastisol, pigment and all types of inks. RIVER SAILOR and MAXCURE comes to you with latest belt tracking mechanism for least swaying of the belt. Very high insulation offers excellent heat retention. 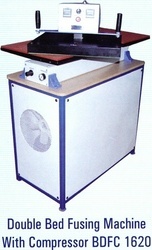 Adjustable heating panel to feed very thick garments and jackets. Easy to lay 3 feet entry belt extension for feeding even ready garments and jackets. Automatic cool down timer to shut of the machine after the machine is cooled down. All world standard parts, there by economy in maintenance. Non stick and heat resistant Teflon belt conveyer. Adjustable entry and exit openings. M/C Dimensions - L 186" W 72" H 50"
M/C Dimensions - L 186" W 86" H 50"
M/C Dimensions - L 186" W 60" H 50"
M/C Dimensions - L 138" W 50" H 50"
M/C Dimensions - L 138" W 38" H 50"
Ultra fast fully automatic most versatile heat transfer press. 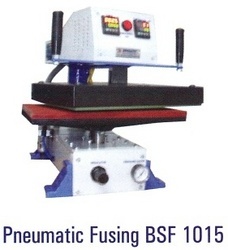 Ideal machines for plastisol fusing, curing and heat transfer printing. Easy operation through pnuematic system. Electronic contactor switching for noise free and zero maintenance. 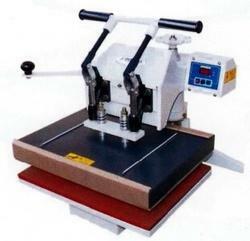 Double tray shuttle system for fast production, one tray is loaded and the other pressed simultaneously. 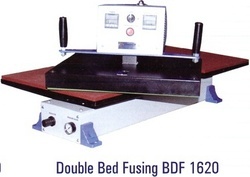 Anti static Teflon is used on the upper bed to prevent corrosion. 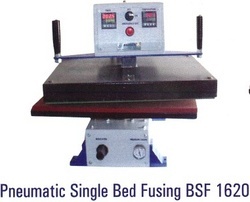 Fabric friendly automatic release of heater bed in case of power failure. Minimum moving parts results in zero maintenance. 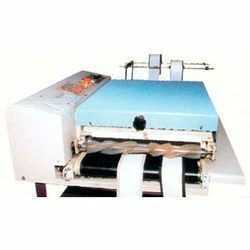 Size - 22" X 17"
M/C Dimensions - L32" W41" H25"
M/C Dimensions - L31" W41" H25"
Fully automatic most versatile heat transfer press. 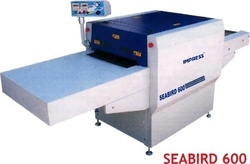 Ideal machine for transfer printing of labels, swatches on lingerie. 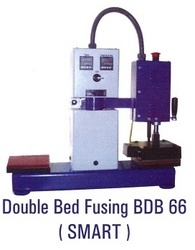 Double platen system for high speed production. SSR switching for noise free and zero maintenance. 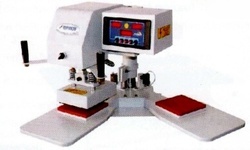 Micro processor based controls gives best adaptability for all kinds of transfers. Meets all international safety features. 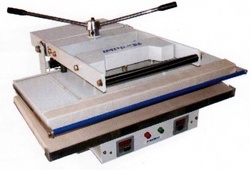 M/C Dimensions - L 24" W 28" H 24"
Size - 15" X 15"
M/C Dimensions - L30" W43" H24"
Ideal machines for plastic fusing, curing and heat transfer printing. Electronic contractor switching for noise free and zero maintenance. 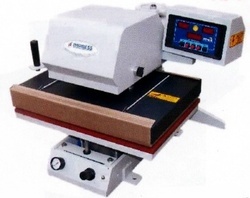 Size - 15" X 10"
Machine Dim - L 25" W 26" H 31"
Machine Dim - L 24" W 21" H 24"
Machine Dim - L 25" W 23" H 24"
Manually operated heat transfer press. Easy operation through clamp system. Machine Dim - L25" W26" H31"
Machine Dim - L28" W26" H31"
Machine Dim - L30" W28" H31"
Ideal machine to fuse collars, cuffs and front placket. Screw jack system for extra ordinary pressure. Easy operation with spring and screw magic. Anti static Teflon is used on the heater bed to prevent gum sticking. Safety rod prevents operators against burns. Actual value temperature control with SSR for extremely precise temperature. Automatic timer to set fusing time. Dwell time alarm to indicate fusing time. 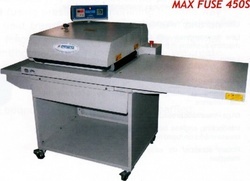 Size - 32" X 16"
Machine Dim - L35" W34" H18"
Size - 37" X 16"
Machine Dim - L35" W39" H18"
Size - 24" X 12"
Machine Dim - L31" W26" H18"
Fully automatic most versatile fusing press. 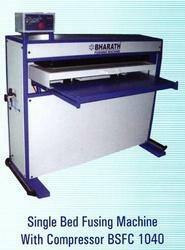 Tray shuttle system for fast production. 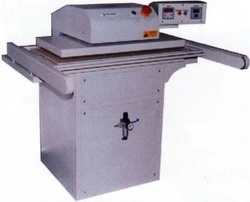 Machine Dim - L35" W39" H55"
Production is greatly increased as this is a conveyor type fusing machine. Machine Dim - L31" W70" H50"
Machine Dim - L31" W64" H50"
Machine Dim - L115" W45" H45"